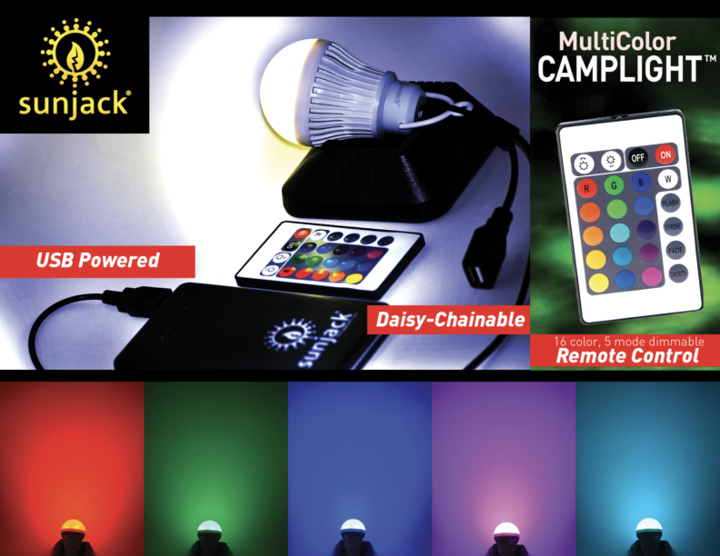 The creators of the world’s most powerful portable solar charger, SunJack, just released the Color CampLight™ - a daisy-chainable USB light bulb that can change colors with the touch of a button. SunJack produces an array of portable solar charging products, including the famous SunJack 20 -- a foldable 20 Watt solar panel with battery backup -- which has been featured in Outside Magazine and the Survivalist. The unit’s efficient monocrystalline solar cells can simultaneously charge two Qualcomm Quickcharge battery packs, which fills in five hours and powers up to eight smartphones.